1.2 How is this book organized? A tedious task, when designing a vacuum tube amplifier, is the identification of the optimal operating points of the various vacuum tubes. The following loadline calculators for vacuum tubes aim at making this task simpler. You can choose your vacuum tubes, set your preferred parameters, and see the effect, by checking the loadline, operating point, and operating range. The simulator can operate with reactive load (for power vacuum ubes) and resistive load. When using resistive loads, it is possible to draw both the DC and the AC loadlines. For pentodes you can chose your preferrer operating modality among triode, pentode, or ultralinear mode. You can also set push-pull or single-ended configurations. If you are not familiar with loadlines, their purpose, and their use, I suggest you checking my guide: Section 3.2 (for resistive loadlines), Section 4.1.3 (for reactive loadlines), and Section 4.2.2 (for AC loadlines). Generic loadline calculator: you can set your preferred parameters on any currently simulated tube and see the produced effect. Power stage with reactive load: you can check your settings for a vacuum tube power stage with reactive load. you can check your settings for a vacuum tube imput/pre stage with resistive load (coming soon). you can check your settings for a concertina vacuum tube phase-splitter stage (coming soon) . Input Stage+DC Coupled Concertina+Power Stage with reactive load: configure togheter all vacuum tubes of an integrated vacuumt tube amplifier, with DC coupled concertina phase-splitter. You can check that all stages have the needed headroom. 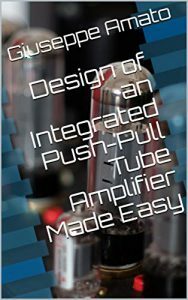 Want to design your own vacuum tube amplifier? Copyright © 2018 - Giuseppe Amato. All material on this site (pictures and text etc.) is covered by Copyright and all rights are reserved. No part of this site may be reproduced without explicit permission of the author.